Dentures are a solution of last resort. Many people assume that they will require dentures as they age, but losing teeth is not a normal part of the aging process. If you care for your teeth well and guard against periodontal-gum disase, you should be able to keep your teeth for a lifetime. With newer materials and improved technology, dentists can fashion dentures that fit comfortably, appear natural and help you stay healthier. Denture problems, such as clicking, slipping, gum irritation, staining and odor are signs your dentures aren’t fitting properly and may need to be adjusted, relined or remade. Although dentures may look like your natural teeth, they cannot work like them. Like artificial limbs, dentures cannot truly replace their natural counterparts. You will have to learn how to use your dentures, which can take weeks. Simple actions like speaking and eating may feel different, and you may have to learn to make adjustments. Types of are dentures-complete and partial dentures. Complete dentures cover your entire jaw, either upper or lower. Some people refer to them as ” plates” . Complete dentures rest directly on the gum that covers the bone. However, a type of full denture, called an overdenture, fits over a few remaining teeth that have been shaped by your dentist. Removable partial dentures are composed of a metal framework with plastic teeth and gum areas. 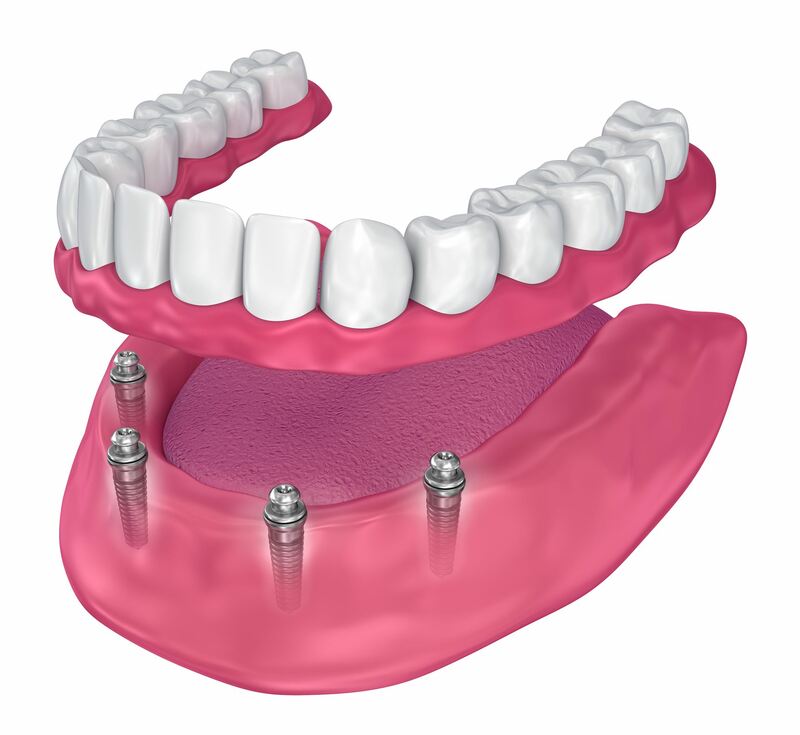 The framework includes metal clasps or other attachments, which hold the denture in place. However, partial dentures are removed easily for cleaning. Metal clasps are C-shaped parts of the denture framework that fit around neighboring natural teeth. These teeth may require shaping to help hold the clasps and keep the denture securely in place. Dentures are made and inserted after your teeth have been taken out and the gums have healed. If you are having teeth removed and getting a conventional denture, you will not be without teeth while your denture is being made. You will receive your immediate denture at the same appointment your teeth are removed. Immediate dentures are made while you still have teeth. Generally, immediate dentures are used for aesthetic reasons in people who need to have their upper-front teeth removed. Having the denture in your mouth also helps control some of the post-operative swelling. A conventional denture takes about six appointments over one month. The process starts with an appointment with us for an exam and a discussion of what will work best for you. In subsequent visits, we will take impressions of your mouth and establish the bite (the way your teeth come together). We will select the teeth for your denture. The size, shape and color of the teeth will depend on many factors, including reference points in your mouth, your skin tone and the shape of your skull, photographs, etc. At a very important appointment, the teeth are held in the base with wax while you have a trial fitting. You can see how the denture looks and feels in your mouth, and we can make sure it fits and functions correctly and harmonizes with the rest of your face. 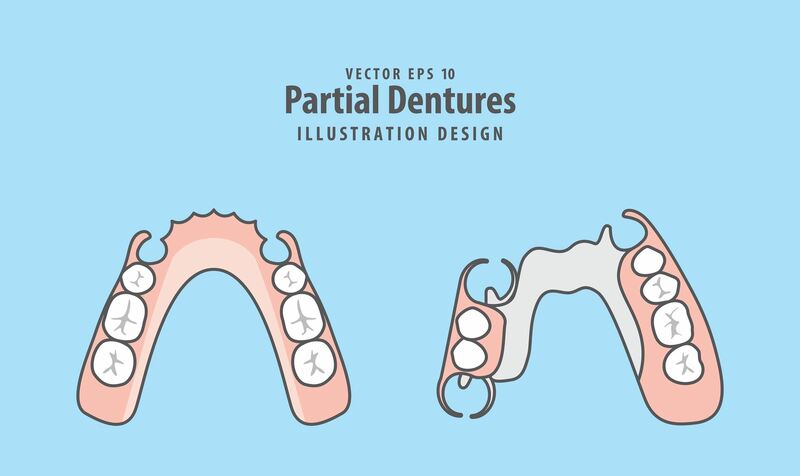 This is your denture preview, or ” try-in.” If this goes well, you will receive the completed denture at the next visit, along with instructions from us on eating, speaking, denture care and oral hygiene.